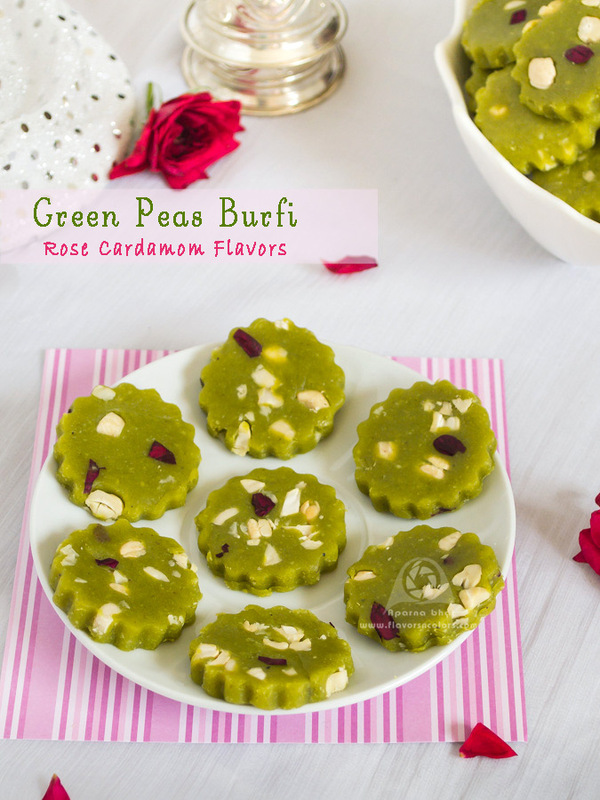 The though of making this burfi came to my mind when I decided to participate in recipe challenge event announced by my friend on her FB group. The theme was festive food with a twist. The challenge was open for sweets as well as savory recipes prepared during festivals celebrated across the globe. 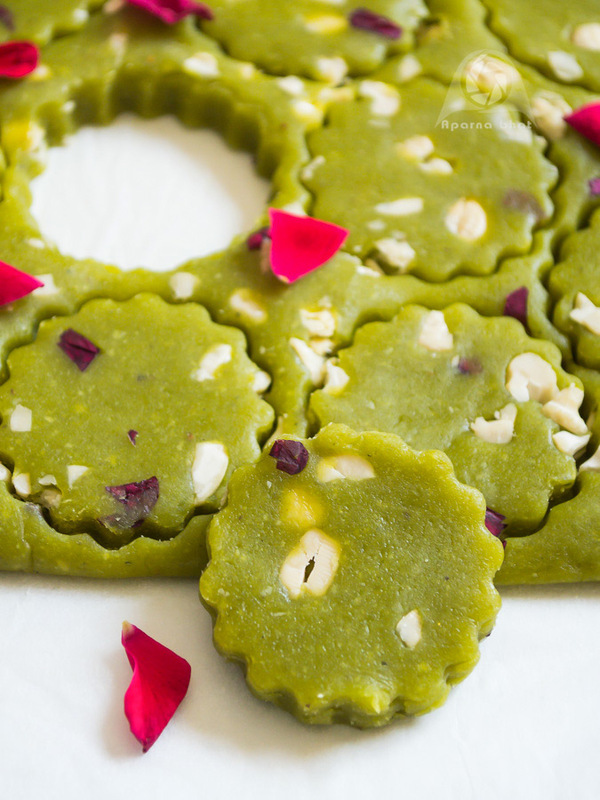 The focus was on aromatic ingredients being used in the recipe - be it cardamom powder, vanilla, saffron, rosewater, screwpine essence, vanilla, spices, etc. 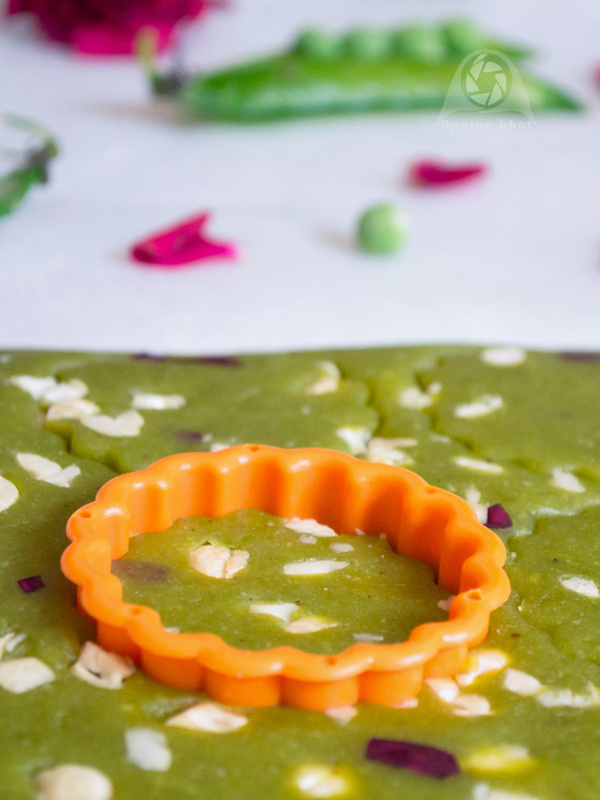 I had a recipe already bookmarked for matar halwa and wanted to try it since long time. But when I recollected that mom used to make khadis/ burfis from carrots instead of halwa [Khadis are nothing but a step further than halwa while cooking the mixture... this would increase the shelf life for the sweet] and then she would store them in dabba. I thought why not try her idea and convert the halwa into a burfi. Diwali being the time where we can expect guests at home, burfis were the perfect dish than halwa while serving them. And also after all those attempts at making different burfis [ read about my attempts here for Kaju Katli, Pista Katli, Badam Burfi, Coconut burfi] I had gathered the confidence in me to go for it . Listed down the ingredients and while shopping unexpectedly came across packet of fresh roses sold in the shop here ... ta ta da ...picked a packet so that these petals could add its gentle sweet flavor and at the same time enhance the look of the burfis. Try this unique combination and be assured to get praises and yeh dil maange more demand from your friends and family. My elder one was enquiring repeatedly ... how come the green color ? No one at home could make out its green peas. Please note that I haven't added any food color, its the color we get from the vegetable itself. Boil fresh green peas, cashews in 1/2 cup milk. Keep it aside to cool. Once cooled, take the ingredients in mixie vessel, add cardamom seed and grind it to a fine paste. Crumble the khoya and keep it aside. Melt ghee in a pan with heavy base/ non stick pan. Add paste and saute it on low heat for 5 mins. Boil the remaining milk and add it to the paste. Mix khoya and powdered sugar. Mix it well until it forms a single mass. Stir it continuously till the mixture thickens and starts leaving the sides of the pan. You should get a nice soft non-sticky ball at the end of this process, ~ ** pinch a portion of the mixture and roll it round in between your thumb and middle finger, when you can do it and the mixture is nonsticky, this should let you know that the mixture is ready**. Add chopped rose petals and mix it for the last time. Switch off the flame. When the heat of mixture is cool enough to handle, transfer it to greased plate or rolling board. Roll it to desired thickness. Sprinkle ingredients of your choice for garnish [ I have used chopped cashews] and then press it gently. Allow it to cool down in fridge for 10 mins. Cut into desired shapes using knife or a cookie cutter. I put the dough on tray lined with parchment paper that was folded like a book. [see in the pic above]. 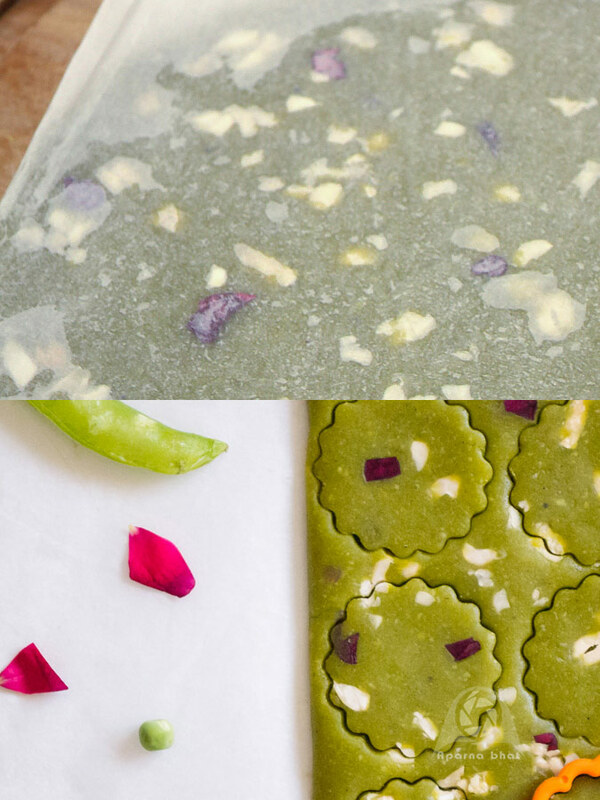 Placed the dough on one side of that paper, flattened the dough, topped with chopped cashews and few chopped rose petals. Covered with other side of parchment paper on top and then with help of rolling pin spread it evenly from all sides to desired thickness. I used cookie cutters to get floral design burfis. All at home are treating ourselves with this dessert after meals. Both my kids are relishing their share and my younger one everytime I offer him a piece he comes up telling me "Big" which means he wants more :). Store the sweets in airtight container and refrigerate them. Happy Cooking and Happy Festive Season !